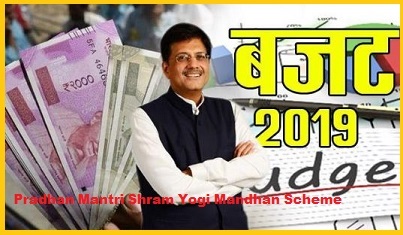 The Union Finance Minister Piyush Goyal on 1st February 2019, introduces the Pradhan Mantri Shram Yogi Mandhan scheme in the interim budget 2019 for workers in the unorganised sector. 1. Under the Pradhan Mantri Shram Yogi Mandhan scheme, an assured monthly pension of Rs 3,000 per month will be provided to workers in the unorganised sector after 60 years of age. 2. To avail of this scheme, workers will have to contribute a minimal Rs 100 month per month. 3. The Pradhan Mantri Shram Yogi Mandhan scheme is expected to benefit 10 crore workers. 4. This new pension scheme will run alongside the existing Atal Pension Yojana, which guarantees returns post-retirement. The interim budget 2019 also increased gratuity limit from Rs 10 lakh to Rs 30 lakh from the next fiscal. The scheme is touted as to become the world’s biggest pension scheme for the unorganised sector in five years. The scheme is designed as a tribute to the workers in the unorganised sector who contribute around 50 percent of the country’s Gross Domestic Product (GDP).